Amrit Yoga Institute, Salt Springs, FL: I have always been drawn to the sky. As a mostly positive person I am always looking up both literally and figuratively. I love to fly, I’m an air sign, wind is my most favorite thing and I would be perfectly happy on the 78th floor of a highrise. Up is my preferred direction. So capturing the goings on above me has become a hobby. For a whole year I posted a sky photo a day on Facebook, ascribing personality, feelings and thoughts to the sky. Whenever I am at The Amrit Yoga Institute for a training or retreat, I do my best to catch the light on the water, in the trees, on the flowers, anywhere really, throughout the day. 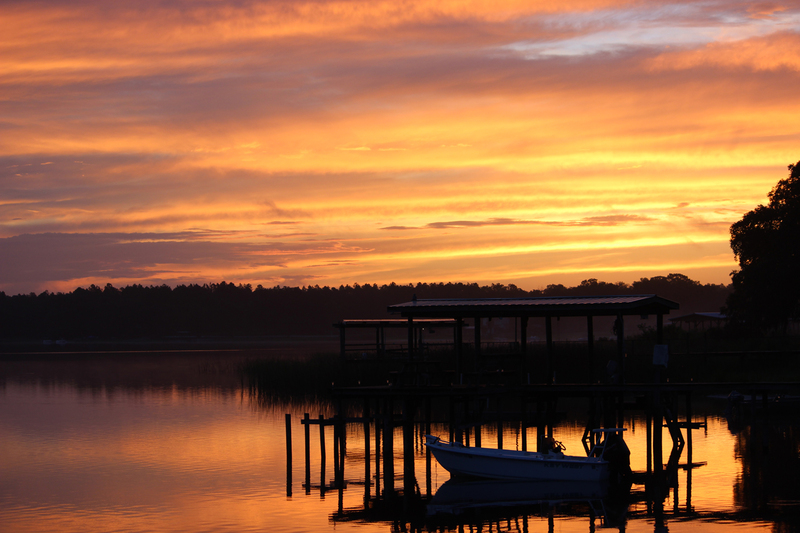 The Institute sits on the south side of a nice size natural lake in the Ocala National Forest, affording views of both the sunrise and sunset over the water. They are not always this spectacular, but they are always beautiful. There is something magical about spending your morning watching the sun rise and your evening watching it set in the same day. There’s a sense of completion and connection, because in these moments there is a stillness called for, a reverence, a recognition that there is a power much greater than you, and for at least those few moments, you’re glad there is.